Party and travel in comfort with a Merritt Island Florida party bus. Come see our deluxe 18 and 40 passenger Merritt Island party buses! 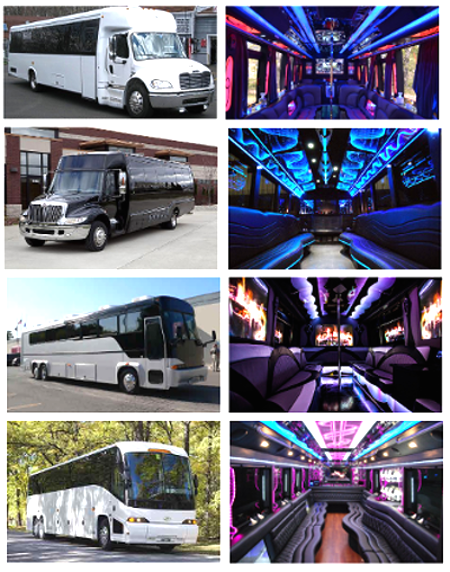 Rent a party bus and get ready for an exciting night out that you and your friends will never forget! Every party bus has big screen TVs, amazing sound systems, plenty of room, multiple bars, restrooms, luxurious leather seating, and much more. To rent one of our amazing Merritt Island party buses, just call Orlandolimorental.com for a quote or to make a reservation. Orlandolimorental.com in Merritt Island Florida provides airport shuttle buses, airport transfers, and airport transportation to all Central Florida airports and sea ports, including the nearby Melbourne Regional Airport, Orlando International Airport, and Port Canaveral Sea Port. We have coach buses, shuttle buses, charter buses, mini buses, and luxury buses available for all your large group transportation. Call Orlandolimorental.com in Merritt Island today for dependable transportation and affordable rates.